People with diabetes are 25 times more likely to lose vision than those who are not diabetic. As soon as you’ve been diagnosed with diabetes, it is important to have a comprehensive eye exam at least once a year. At Berks Eye Physicians & Surgeons we perform a thorough retinal exam through dilated pupils to check for any diabetic complications including diabetic retinopathy. 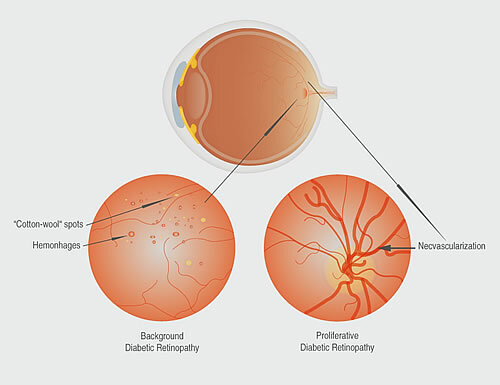 Everyone who has diabetes is at risk for developing diabetic retinopathy, but not all diabetics develop it. The retina needs careful examination if you are diabetic. In its early stages, you may not notice any change in your vision. This is why annual exams are recommended even if you have no symptoms. Changes in glucose levels increase your risk of diabetic retinopathy, as does long-term diabetes. Diabetes can damage the blood vessels in your eyes causing them to leak which can cause vision loss. According to the American Academy of Ophthalmology, 95% of those with significant diabetic retinopathy can avoid substantial vision loss if they are treated in time. If you are diabetic and have not seen an opthamologist in more than a year, call Berks Eye Physicians & Surgeons today at 610-372-0712.